Network Rail has been fined £4m for the breaches in health and safety that led to the 1999 Paddington rail disaster. 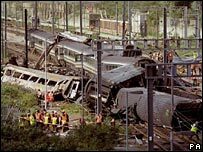 Network Rail, which had admitted health and safety blunders occurred before the crash on 5 October, 1999, was also ordered to pay £225,000 in costs. A Thames Trains service hit a First Great Western train at Ladbroke Grove, west London, killing 31 people. Critics say the money should come from Network Rail bosses, because otherwise the fines will be paid by the public. Network Rail replaced Railtrack, which had been responsible for maintaining Britain's railways, in 2002. The Thames train had gone through a red light at signal SN109 shortly after leaving Paddington station. Blackfriars Crown Court has previously heard that a "catalogue of failures to act" by Railtrack led to the disaster, which left more than 400 injured. 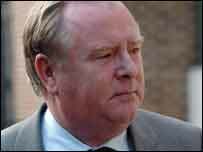 Prosecutor Philip Mott QC told the court that concerns had been raised about the safety of signal SN109 as early as November 1995. There were seven previous occasions where a driver went through the signal at red - known as Signal Passed at Danger (Spad) incidents - in the five years leading up to the crash. The court heard that Michael Hodder, driver of the Thames train, probably assumed he could continue because of the "absence of a visible red at SN109". Network Rail chairman Ian McAllister said: "Network Rail is sorry for the failings of Railtrack some seven years ago that contributed to the tragedy at Ladbroke Grove. "Network Rail accepts the fine imposed by the court." Mr McAllister also said that since Network Rail took over from Railtrack it had completed the installation of an automatic train braking system which would have prevented the Ladbroke Grove crash. "This system, called the Train Protection Warning System (TPWS), will automatically apply a train's brakes if it passes a signal at red or approaches one too quickly," he said. Chairman of the Paddington Survivors Group, Jonathan Duckworth, who was injured in the crash, said the fine should serve as a message to other companies. "The clear message from this court sentence is that you cannot mess around with people's lives," he said. "It sends a message to all other companies. It was very clear from the evidence that the corporate culture at Railtrack was very poor indeed when it came to safety. "It was not just individuals who were at fault. It was the whole company." Maureen Kavanagh, chairman of the Safe Trains Action Group, lost her son Peter, 29, in the 1997 Southall rail crash. She said: "A fine is not enough and is not justice. It's taxpayers' money anyway. The money will just be shuffled around from one government department to another." Keith Norman, general secretary of the drivers' union Aslef, said the money should be taken from the bonuses of senior Network Rail managers. "If the managers are not fined personally, it means the fines will be paid by the public," he said. "This would be a terrible injustice to passengers who would end up having to pay for being killed, maimed and injured. "The fine imposed will come out of company funds and be paid to the government - which effectively owns the company. "So the only people to suffer from the fine will be the travelling public because the fine will mean that the company has less to spend on the rail infrastructure of this country." Rail Maritime and Transport union general secretary Bob Crow said: "Privatisation, fragmentation, the absence of train protection and the lack of corporate accountability were at the heart of the Ladbroke Grove tragedy, and each problem remained to be dealt with." Chris Newell, the Crown Prosecution Service's principal legal adviser, said British Transport Police had conducted "exhaustive inquiries" into the crash and produced "thousands of pages of evidence." He said: "The evidence led to the inescapable conclusion that Network Rail failed utterly in its responsibility to protect the health and safety of passengers in its care."